Products are 100% natural: they do not contain artificial fragrances or other chemicals. For internal use, essential oils can be used as natural flavourings for food products (one drop to flavour 100 g / 100 ml of food / drink). One should not use pure essential oils but always dissolve them appropriately. For internal use, they may be dissolved in a sugar lump, a teaspoon of honey, or a bottle of water to drink throughout the day (shake the bottle vigorously until the oil has dispersed completely). For external use, they may be dissolved in an emollient oil (such as almond oil, extra-virgin olive oil or other oils) and used to make hair packs or to massage your skin. You can add a few drops to your bath, sauna or to a pot of boiling water to make inhalations. Also, essential oils can be used in vaporizers or in aroma lamps to purify and perfume rooms. All essential oils are processed with a special method that the Ancients used to call "vivification" and that Dr Giorgini has resumed to offer his consumers pure and top quality essential oils. The "vivification" is obtained by adding an essential oil to the salt extracted from burned and calcined plant ashes. The essential oil and the salt are placed in a glass tool, called "circulatory pot", composed of two bowls, connected to each other through their opening and sealed. The pot is placed in a suitable device in such a way that the upper bowl is in a cool place, while the lower one is in a water bath constantly heated at 36°C for 6 months. Salt, being insoluble in essential oil, does not dissolve in it and, therefore, the transformation that occurs in the essential oil is not due to a dissolution of the salt but, as the Ancients believed, by an enrichment in the so-called Energy of Life. 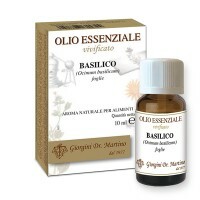 All Dr Giorgini's essential oils are processed with this special method, to offer the customer unique quality VIVIFIED essential oils. "Vivification" is clearly visible in some essential oils that, from clear or slightly straw-yellow, become dark yellow or, sometimes, even blood-red.